Let’s face it real leather furniture doesn’t come cheap and for this reason you’d probably want to do everything you can to keep it in good condition and to protect your investment. The good news is that with proper leather furniture care it can look as good as new for many years to come. Without further ado, here are a selection of things you can do to maintain your furniture. 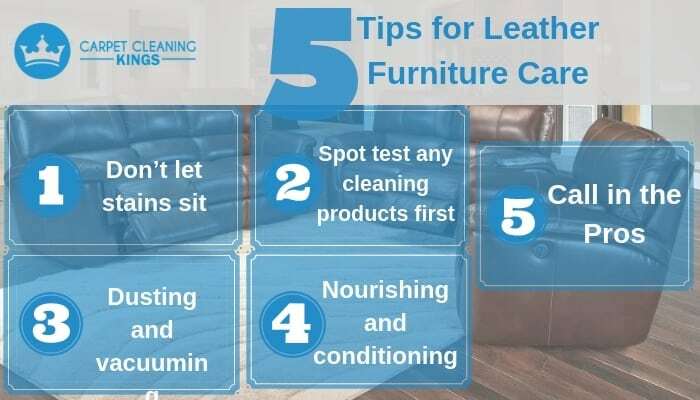 Although leather furniture is considered harder to stain than it’s fabric counterpart they can still cause problems, particularly if left. Just like you would a carpet, any stains should be cleaned up as soon as possible to avoid furniture discolouration. First remove the stain using a gentle blotting action then using a dry soft cloth wipe the area dry. If the stain is grease-based you might want to avoid applying water as it can make the stain worse. Instead use a mild cleaner specially made for removing grease. Even if you are using any formulas which are designed to clean leather you might want to spot test them first. Try placing a tiny dab on an unnoticeable place (eg, a small corner on the back of the furniture is good). Then see if there’s any reaction to the leather. If all is okay, then it’s probably good enough to use on the rest of your furniture. Leather furniture just like any other type of furniture can collect dust, particularly in the recesses. Large furniture dusters can be purchased which make light work of the job and keep it dust-free to boot. In addition leather furniture could also do with a vacuum. In fact, for best results, home owners should consider vacuuming their furniture as often as they do their flooring and carpets. An important part of leather furniture care is nourishing it to develop that lovely old patina. Things like saddle soap, lint-free cloths, and microfibre can all be used to refresh and rejuvenate tired old leather furniture and keep it looking as good as new. Finally it may pay you to call in the pros particularly if you lack the time or experience to do it yourself. Not only this, a professional annual clean alongside regular home cleaning is one method of leather furniture care that makes sure your leather furniture stays supple, pigmented, and above all comfy. If you’d like to make enquiries about having your leather furniture cleaned, or indeed any other type of upholstery or carpets, then why not contact Carpet Cleaning Kings. We have years of experience within the industry and as such we do all we can to make sure that our cleaning stands out for all the right reasons. For a free, no-obligation quote call us today on 1300 7000 75 and let us show you exactly what we can do for you.